It’s Black History Month! We’re starting off the month with an interview by Charles Warner, a web designer living in New York City. (If Charles’ name sounds familiar, it’s because he’s business partners with another designer we’ve interviewed — Alrick Collins, Jr.!) It’s always good seeing other designers work together and collaborate. We talked about his inspirations, as well as about how being a devout Christian influences how he approaches his work. Enjoy! Let’s start with my back story. I grew up with low self-esteem. I thought of suicide many times, but fortunately for me, I got involved in the Boy Scouts of America and found a few older teenagers and young adults willing to mentor me. This kept me from wanting to end my life. Besides that was the fact that there would be no turning back once that task is done. When I was 12, I became a Boy Scout and since then I’ve worked on building my self-esteem. One day, a manager at the financial services company I worked at invited me to lunch. He invited me to his church, and I gave my life to Christ and became a Christian as a result of this during the 40 Days of Purpose, a time period that Rick Warren had churches do a sermon series on his best-selling book The Purpose Driven Life. During the Week of Service, I knew I should serve, but couldn’t decide where. Ultimately, I ended up serving in the multimedia ministry. My role was to transform the pastor’s weekly message from a Microsoft Word document into a Microsoft PowerPoint presentation. A few months later, a second-generation military aviator was coming home for the first time in a very long time. I ended up gathering a combination of military and family photos to put together a slideshow presentation for his family. It was at this point that I realized I could help churches and ministries grow through multimedia and I decided to go back to college and pursue my degree in web design. I am currently in my senior year at the New York City College of Technology, where I am majoring in advertising with a concentration in web design. Christian Webworks Designs Inc. is the brainchild I formed to aid the Christian community in gaining an Internet presence. I am striving to help that environment regain popularity. Did you have a creative childhood? How did you get started in design? I always liked design, but I really did not develop that talent much. Growing up, I was more focused on which ads and logos grabbed people’s attention better than others. That’s why I’m an advertising major. Have you had any mentors to help you as you became a designer? Finding a mentor in this line of work is quite difficult. Your best chances of getting one is having a professor who personally cares for their students. Other than that, you are on your own. How would you describe your design style? Name some of your influences. Truth be told, I’m not much of a designer. I like to look at things and ask myself why it works (or doesn’t work). I haven’t really come upon my own style as of yet. You’re based in New York City, and you’ve worked with another designer we’ve interviewed, Alrick Collins, Jr. How did that partnership come about? I met Alrick in a digital photography class at City Tech. While we were looking around to take photos for class, we were talking about what we do. He is a graphic designer who is not really interested in coding, and I’m a web designer but I lack artistic ability. From that, we decided to form an alliance between his company and mine. Are you active in the design community in New York City? I just recently became a member of the Graphic Artists Guild and the Art Directors Club to gain mentors. Every January, I go to The One Club’s Creative Boot Camp at Macaulay Honors College at CUNY. There was a discussion a few months ago on Designer News about design and religion. Being a Christian designer, have you faced any sort of backlash for communicating your religious beliefs through your business? Everyday, I face the challenge of whether I should label my business as a Christian business or not. Over the years, many people have tried to talk me out of it; these people don’t see the big picture that I see. They see someone who is discriminating against those who are not Christians. The question I’m answering is “what about those who are Christians?” Too many of them have been the focus of discrimination. I don’t use my business as a platform to hate or resist those that are not Christians. Instead, I use it as a platform to foster Christian beliefs. I really believe that with a skill set that’s a dime a dozen, the best way to stand out is to find a new dozen. Not many companies like mine are focused on helping the Christian community, churches, and ministries. What that means to me is that there are few companies that would know the language that Christians would use, and it’s that skill that makes me more marketable than my competition. I stay focused by thinking of how society is falling apart. I feel it is due to a lack of ministerial guidance in families. So when I think of why I do what I do, I think of how my childhood included mentors and role models, then I think of building an Internet presence for them to assist the churches in accessing teenagers through the Web. If you could create a design for any space in the world, what would you create and where would it be? I would create a design for a game room that would include both video games and billiard tables. What advice would you give to someone just starting out in this field? Remember why you want to do this. You will always have pessimists around you, and unfortunately they can be your own family members and closest friends. Unless you really enjoy it, get out now. The road can be quite treacherous and without a firm stance in what you want to do and a good support network, you will not move forward. 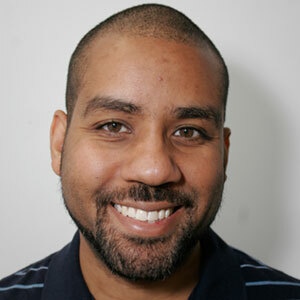 About Charles: Charles Warner is a web designer and web developer living in New York City. You can find out more about his work at his website, or contact him on Facebook or Twitter. I truly love your story. It is real and heart felt. Truly an inspiring individual.